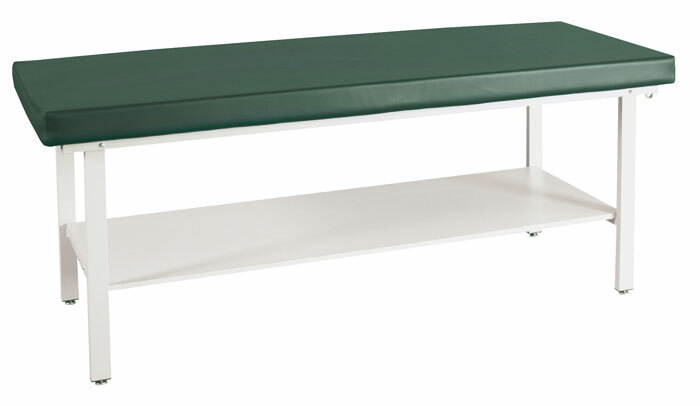 Metal, wood and laminate bench and cabinet style tables are shown on this page. 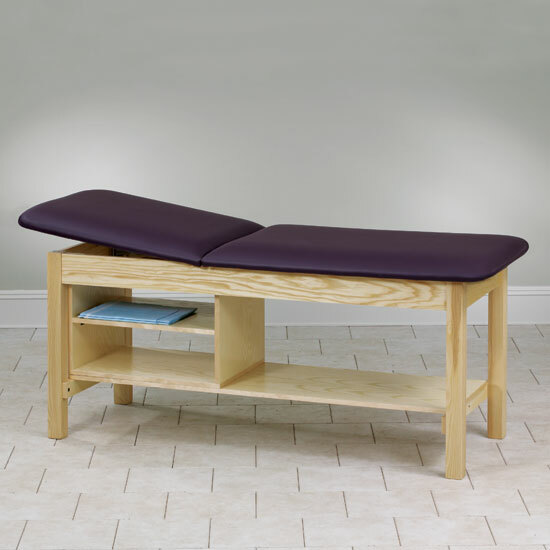 Pneumatic-Assist Adjustable Backrest and 400 lb. weight capacity. Available in 3 heights: 25", 30" and 36". Overall length: 72"; Weight: 96 lbs. 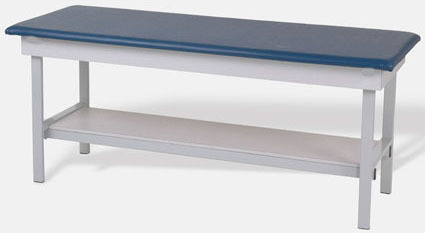 One touch, infinite position pneumatic-assist adjustable backrest. Available in a variety of vinyl colors. See link to right. All prices quoted are FOB Factory. Freight is pre-paid and added to invoice. Prices are subject to change without notice. Available in 3 heights: 25", 30" & 36". 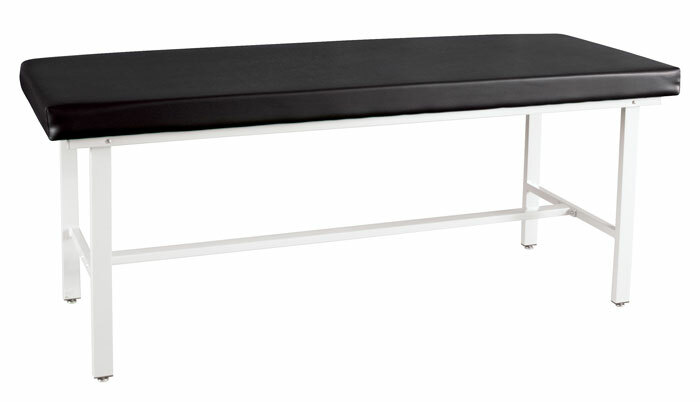 Overall length: 72"; Weight: 116 lbs. 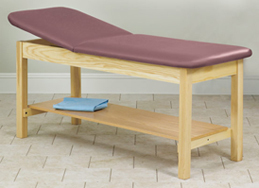 2) Steel Frame - Bench Style Treatment Table with a non-adjustable backrest and a 400 lb. weight capacity. Available in 4 heights: 19", 25", 30" & 36". 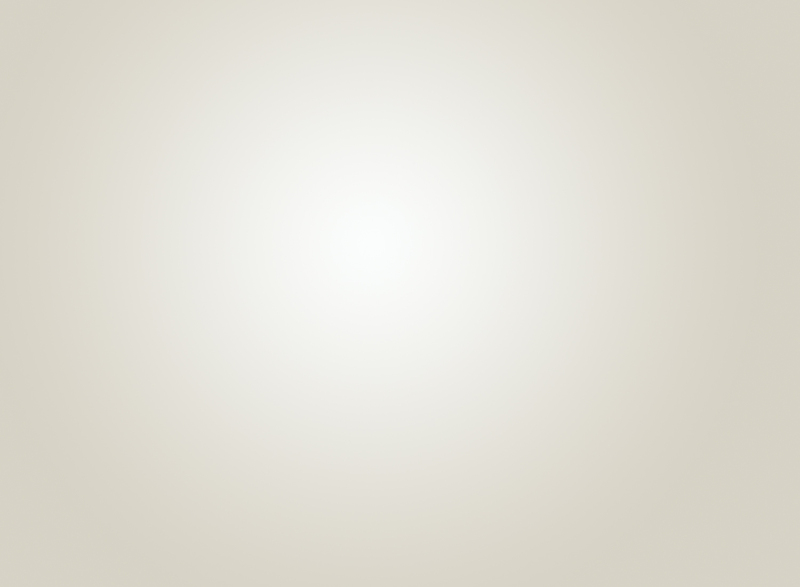 Overall length: 72"; Weight: 82 lbs. Also available with face cut-out. High strength powder coated, steel frame with a 400 lb. weight capacity and storage shelf. 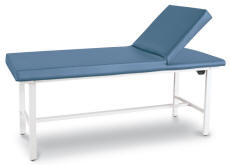 Winco's most versatile and popular table features a face cut-out, allowing patients to lie face-down without having to turn their head to the side. 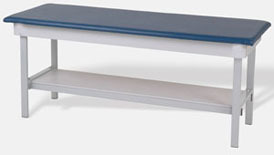 Includes Dove-Gray Powder Coated Steel Frame, paper roll holder and cutter and adjustable leveling feet. Includes a comfortable contoured headrest. Shown with shelf. Overall length: 72"; Weight: 73 lbs. Comfortable 2½" high medium density foam for superior comfort. Table paper holder included with this couch. and cutter? See options shown below. 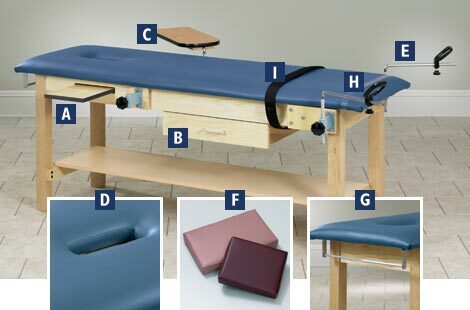 Clinton #1010 Treatment Table with H-Brace. Quick Ship! 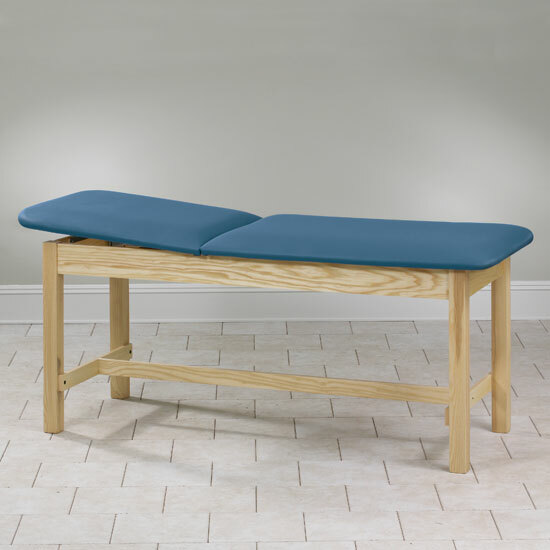 Features hardwood legs and adjustable backrest. 400 lb. load capacity under normal use. Available in 24", 27" and 30" widths. Length: 72"; Height: 31". 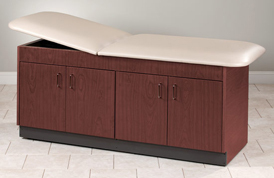 Clinton #1013 Treatment Table with Drawers. Quick Ship! 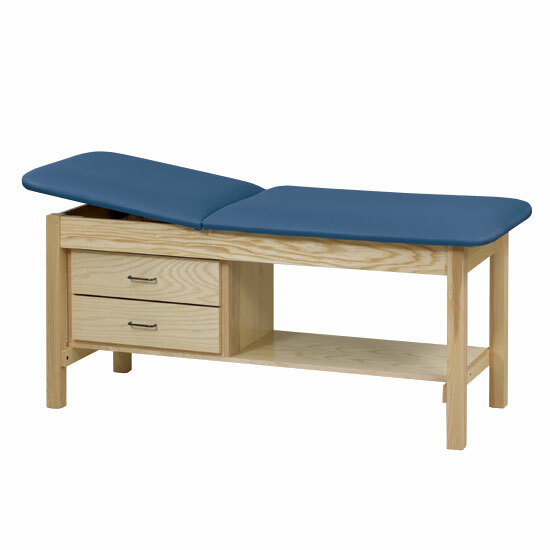 Features hardwood legs, laminate shelf, two easy clean plastic drawers and adjustable backrest. Available in 27" and 30" widths. Length: 72"; Height: 31". 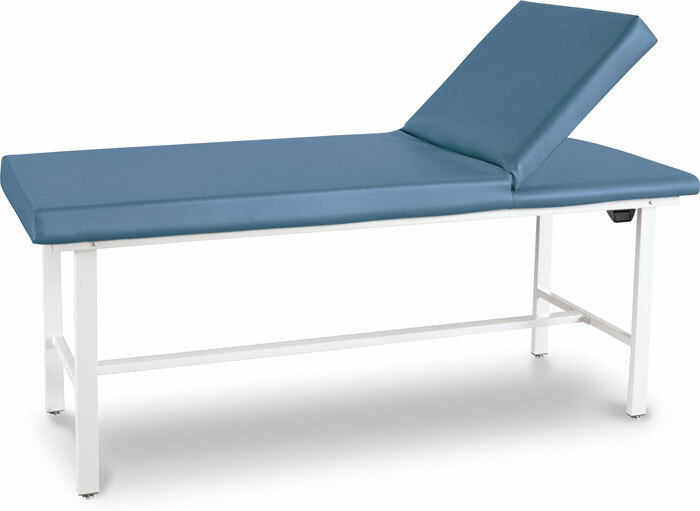 Clinton #1020 Treatment Table with Shelf. Quick Ship! 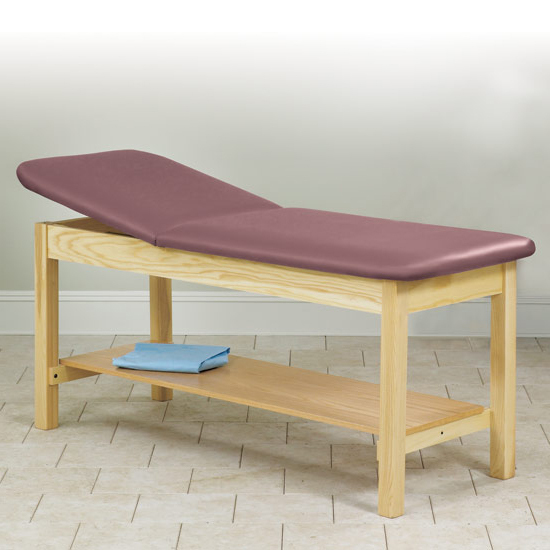 Clinton #1030 Treatment Table with Shelf. Quick Ship! 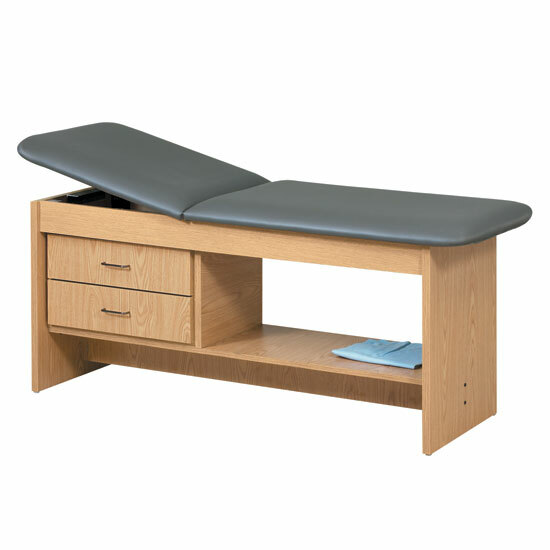 Features hardwood legs, laminate shelf, storage compartments and adjustable backrest. 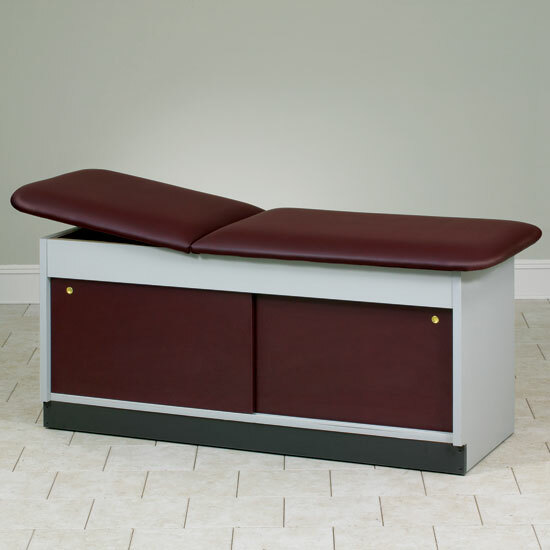 Clinton #9013 Treatment Table with Drawers. Quick Ship! 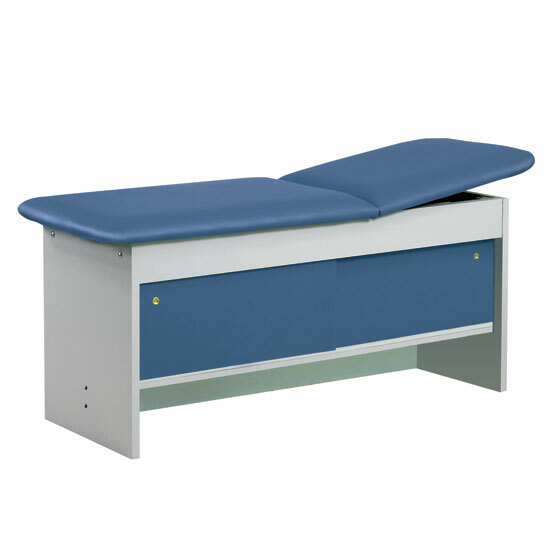 Features all laminate surfaces and adjustable backrest, two easy clean plastic drawers, shelf and adjustable backrest. 350 lb. load capacity under normal use. Choose from a variety of laminate and vinyl color choices. Quick Ship in Gray and Natural laminate finish only. Features two storage compartments with sliding doors, an adjustable shelf in each compartment and an adjustable backrest. Doors can be on patient's right or left side. 425 lbs. load capacity under normal use. Features two sliding doors front and back and an adjustable backrest. Clinton #9074 Cabinet Style Laminate Treatment Table. 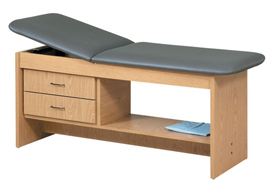 Features four doors, adjustable backrest and 2 storage compartments each with an adjustable shelf. Adjustable doors with concealed, self closing, Euro-style hinges. Doors can be on patient's right or left side. 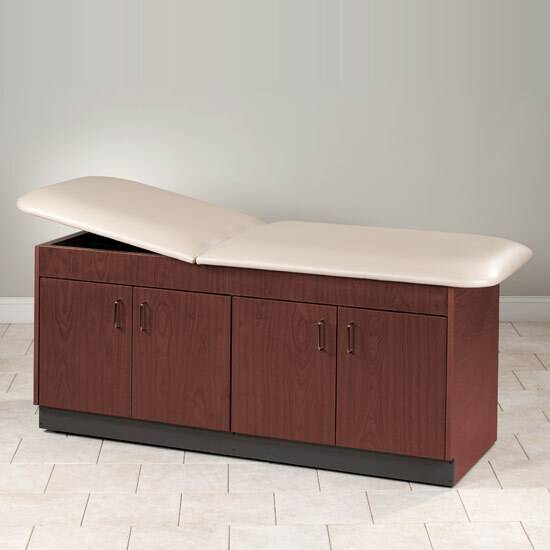 Clinton #9105 Cabinet Style Laminate Treatment Table. 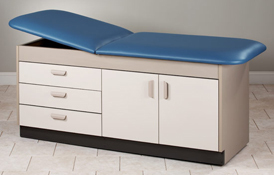 Features adjustable backrest, three drawers and two doors with storage compartment and adjustable shelf. Adjustable doors feature concealed, self closing, Euro-style hinges. Doors can be on patient's right or left side. Available in a 30" width only. Length: 72"; Height: 31". Features an epoxy coated metal frame avaiable in 20 diffferent colors. Extra Wide Overall Width: 28"
Overall height: 20" - 36". State desired length of table top when ordering. Limitations do apply. Contact us for details. #088 Flat Top Option - must be specified. No additional charge. 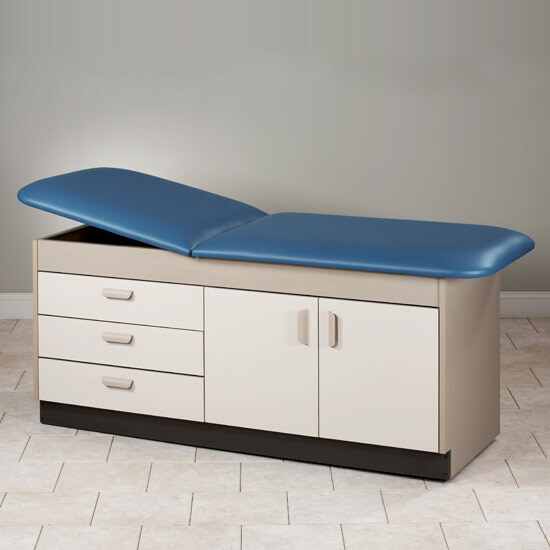 Need Matching Winco Exam Room Stools? 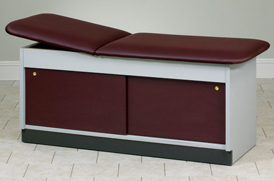 Click here for Winco Exam Room Stools. 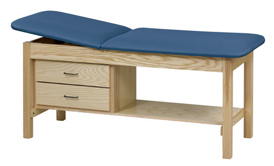 Need Matching Clinton Exam Room Stools? #T-40 Step Stool, chrome-plated, 11¼"w x 14¼"l x 9"h. Includes rubber tread top for safety and rubber feet. Weight capacity: 300 lbs. 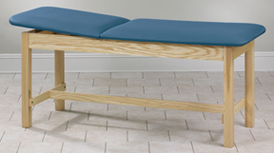 See step stool page for stools with higher weight capacities. (Minimum order is 2 step stools.) Call for freight cost. Call for freight cost. Click here to see other step stool choices. 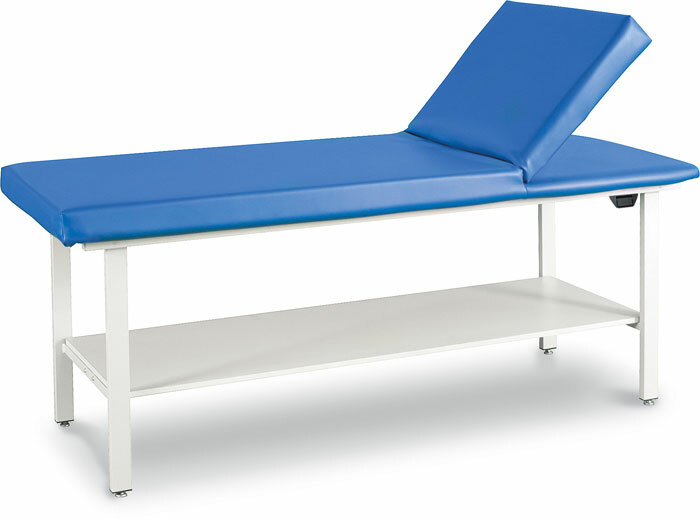 TS-170 Overbed Table includes walnut laminated top, chrome-plated base and single hand-spring loaded lever height adjustment. Also includes dual wheel nylon casters. Height range: 28" - 43". Shipped knocked down. Weight capacity: 50 lbs. 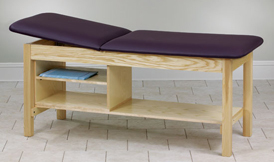 Click here to see other overbed tables. Call for freight cost. 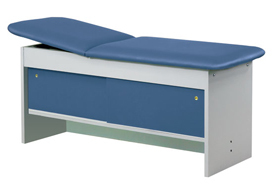 TS-175 Overbed Table includes gray laminated top, chrome-plated base and single hand-spring loaded lever height adjustment. Also includes dual wheel nylon casters. Height range: 28" - 43". Shipped knocked down. Weight capacity: 50 lbs. and added to invoice. Prices are subject to change without notice.